He was also one of the pioneer members who surveyed the Itanagar area for establishment of capital when it was being shifted from Shillong to Itanagar. Late Kacho was a active social workers hailing from Pempla village in Tarasso circle and was Goan Burha of Pempla village. He was actively involved in various social welfare activities and development of Taraso and Balijan circle. 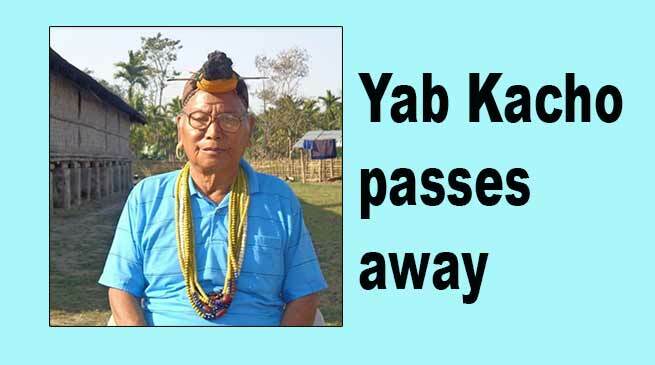 Late Yab Kacho has left to heavenly abode at the age of 86 year at 9.30 pm at his residential village Pempla on Sunday last. He had married five and left behind three wives, ten sons, twelve daughters and many grandsons and daughters. He had served in various capacities to the society as former Gram Panchayat Member and Anchal Samiti Member during the time of undivided Subansiri district, Arunachal Pradesh. He was also the Founder Chairman of Pempla Nydar Namlo under Tarasso circle, Papumpare. Tarasso Circle Goan Burha Welfare Association (TCGBWA), Tarasso Circle Youth Association (TCYA), All Papum Poma Students’ Union and family members deeply mourns the demise of Late Yab Kacho and prayed for the eternal peace of the departed soul. His demise has created a huge vacuum in Nyishi society and state as a whole which cannot be replaced again. A separate release issue by Camdir Welfare Society (CWS) President Teli Tada Camdir said that Late Kacho was involved in several social welfare activities and have worked for the development of the Tarasso and Balijan Circle and was actively involved in solving several judicial problems of the area by his knowledge and experience as a GB. He will always be remembered for his good works and his humble nature in the community and society. The last rite will be performed on 12th February, 2019 at his residence in Tarasso at 12.00 noon. Tada said.